About a month ago, Chuck from the Bad Feeling podcast asked Keith a question in an interview that seemed quite naive to me at the time: Why can't all the Cartel Market items ever released be available for purchase at all times? Keith answered pretty much as I expected: That this would only make them a lot of money in the short run, but less in the long run. Perceived scarcity and fear of missing out are a thing. However, it seems that either Keith had a change of heart after that interview, or maybe someone else from his team tapped him on the shoulder afterwards and went: "You know, I agree that this wouldn't be a viable strategy in the long term... but why not try running it as a limited time event?" And thus, the big Cartel Market Spring Sale was born. I have to admit, I actually got a little excited about this one. I'm not a frequent customer of the Cartel Market, but my "complimentary" aka free Cartel coins had been getting close to hitting the 50k mark again and I've been longing for a reason to spend some. Surely, when provided with that much choice, even I would be able to find something to my liking? And the answer is: yes! There is something relaxing about flipping through pages and pages of cosmetics during a break in an ops run or while chatting away with guildies on TeamSpeak. The first thing I bought was a type of grophet that I didn't own yet, because you can never have too many grophets (I hope). I've never been a fashionista, with most of my characters just sporting a look cobbled together from various pieces of gear that they acquired "naturally" at one point or another, but I have been known to change outfits on my main and a couple of alts on occasion. 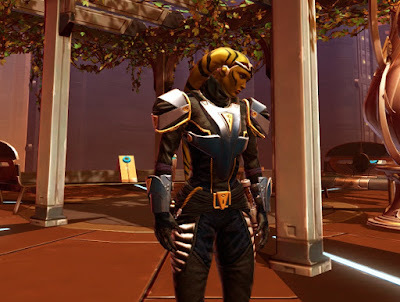 And acquiring some more couldn't get much easier than having all those outfit designer slots, thousands of spare Cartel coins and being presented with dozens of complete outfits only a mouse-click away. Battlefield Commander set for my main: She's the one who changes looks the most often, and to be honest she was kind of overdue for a new one. I remember liking this set when I first saw it, but not enough to buy it then and there. To be honest it seems a bit more suited for an Imperial soldier than for a Republic one, but since "Imperial trooper" is not a class this seemed like the next-best character to wear it. I was kind of surprised by how light the set was in game, as the preview picture had made it look almost black. Fortunately I still had a bound black/black dye lying around in my bag that I had pulled out of a cantina crate ages ago, so it was simple enough to adjust the colour to a darker hue. Who's this? 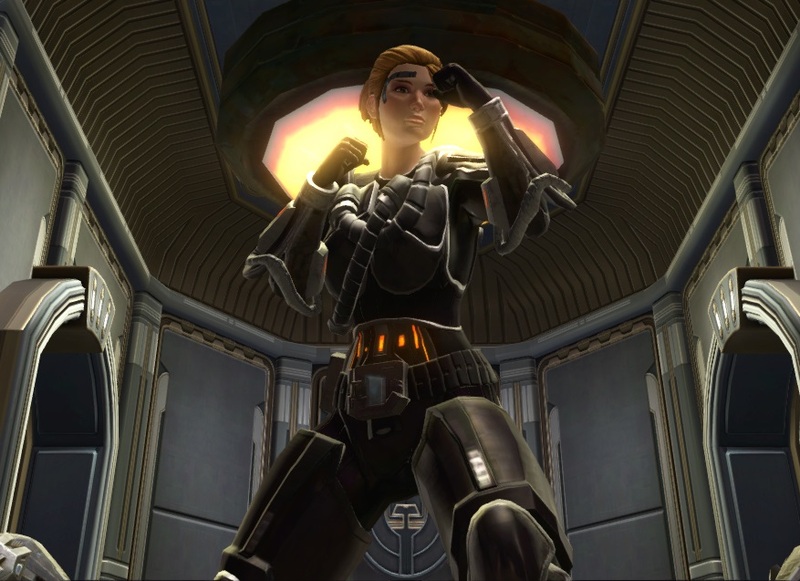 This is Cheriza, the Juggernaut I created for the Dark vs. Light event and haven't really played since then. Why buy her a new outfit then? 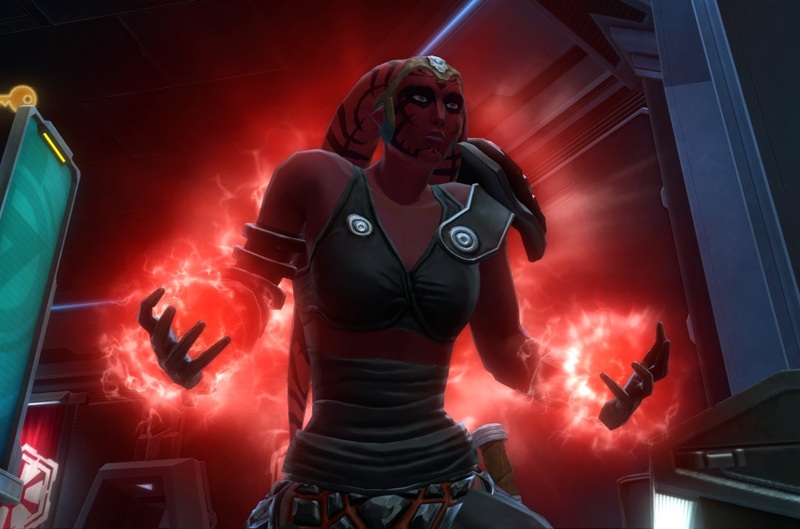 Because I thought Darth Sion's armour set looked really cool, but wouldn't look right on anything but a tall, bulky Sith, and she fit that description better than any of the other alts in my stable. Maybe the new look will inspire me to play her more? Finally, the Bold Hellion set for my Gunslinger: I remember seeing this set a few times before and admiring all the details on the chest piece, but it struck me as only really suitable for a smuggler and I didn't feel that any of mine really "needed" it. As I recently caught myself thinking about getting my Gunslinger a new look however, it suddenly seemed like an interesting option. I'm still not convinced by the bare midriff (too dangerous, even for a happy-go-lucky smuggler), but maybe this is her idea of "dressing up" for a night out. In short, this is one money-making attempt that I can get on board with, though of course I'm coming at it from the biased perspective of someone who didn't actually have to spend any money beyond her normal subscription to be able to buy all this stuff. Far be it from me to suggest that anyone should spend money on Cartel coins, but I do have to say that if you've ever been interested in gear from the Cartel Market but missed it being on offer or it came from a random pack and you didn't want to try your luck, this is a great opportunity to have a browse and consider your options. I've heard some grumbling that not truly "everything" is in the sale, and that may well be the case, but it sure is a lot to impress someone like me who's not that intimately familiar with the cash shop and everything that's been on offer over time. The sale event will run until the 17th of April, so you have over ten days left to have a look at the available selection and make up your own mind. While this deal is fantastic, I find myself very baffled by the price for the Revanite Champion's armour set. Firstly, the fact that this set is being sold directly at all is fantastic, given that it could only be a very rare drop from the Galactic Legends pack and from no other sources (I don't recall anyone saying they got it from a Grand Chance Cube, although it might have also been added to the pool for the Ultimate Pack), but its price of 1,440 is excellent considering that this is the same price as the majority of other Gold Armour sets and is cheaper than some others. I can understand the Revan Reborn, Satele Shan, and Tulak Hord sets being expensive, but quite why they made the Tythian Disciple's set of all things 2,000 Coins is beyond me. I spend 350 Million Credits on stuff. Hover Chairs and Thrones; Armour Sets and Flairs; Emotes and Decorations. Just a few weeks ago, i would have to spend three or four times as much on every single item. Good times. I save my Cartel Coins for the unlock fees. Pugging with Shintar is back!